It will go down as the year Minjee Lee arrived on the world stage. And while toppling the legendary Karrie Webb as Australia’s number one woman player was an undoubted highlight, the honours have kept flowing for Lee including last week being awarded the inaugural Herb Elliott Medal at the Western Australian Institute of Sport’s annual dinner. The Perth teenage was nominated alongside WA cricket captain Adam Voges, who became the oldest debutant centurion in Test cricket history in the West Indies, and Caitlin Bassett, who helped Australia to win the 2015 netball World Cup. Former 1500m runner Herb Elliott became a legendary figure in Australian sport when he won the men’s 1500m at the 1960 Olympic Games. The medal was struck in his honour to recognise an inspirational sporting performance by a Western Australian every year. 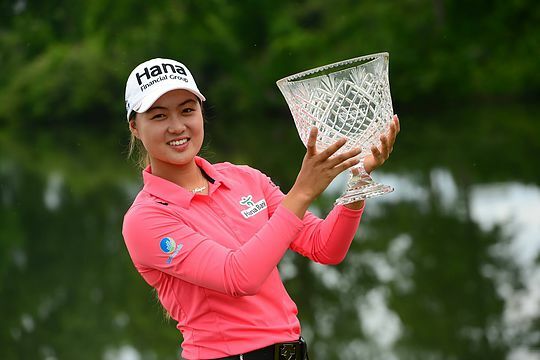 Lee’s maiden US LPGA Tour victory in the $1.3m Kingsmill Championship in May saw her surge to prominence in becoming just the seventh woman in LPGA history to win on tour before the age of 19. While Lee was playing in Korea at the Hana Bank LPGA Championship and couldn’t be present, she was beamed in live via video and expressed her pride at winning such an accolade. Golf Australia national coach Ritchie Smith was on hand to accept the award from Elliott himself. “When I was up on the stage Herb Elliott told me he couldn’t believe how good she was and how beautifully she swung the golf club,” said Smith. “Minjee is a really proud West Australian and is well aware of Herb Elliott’s achievements.